The guidelines I'm giving you here are from a book called Potatoes by Sue Kreitzman and published by Crown Publishing Company in 1989. I think I bought it when I was a vegetarian (for almost a whole year) and needed some new ideas. 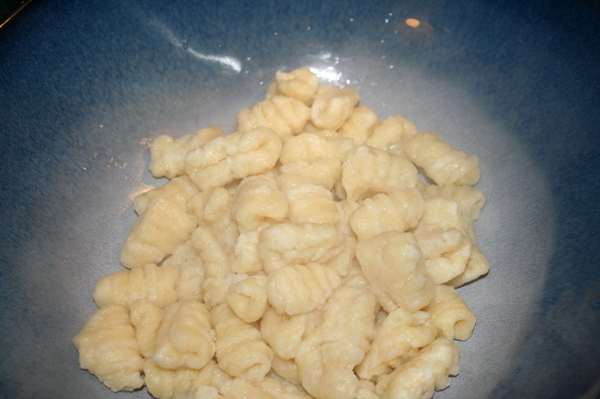 Potato gnocchi are soft and pillowy and not really as terrible for you as you might think. Okay, yes, they've got white flour. And yes, potatoes. But potatoes are also full of vitamins and potassium and other nutrients. 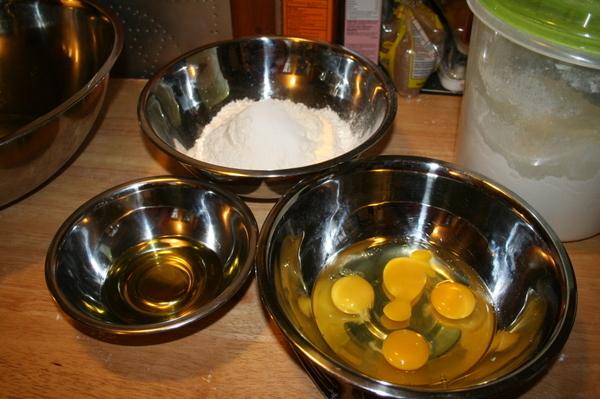 And there are eggs in the recipe - a perfect source of protein. And olive oil - one of the good fats. And some salt. And that's the basic recipe. First thing, you want to roast the potatoes. When they're cooked through, let them cool a little bit - not too much, while you measure out the other ingredients. For this basic recipe, you want about 6 large baking potatoes. Okay, now get a very large bowl and get your potatoes. 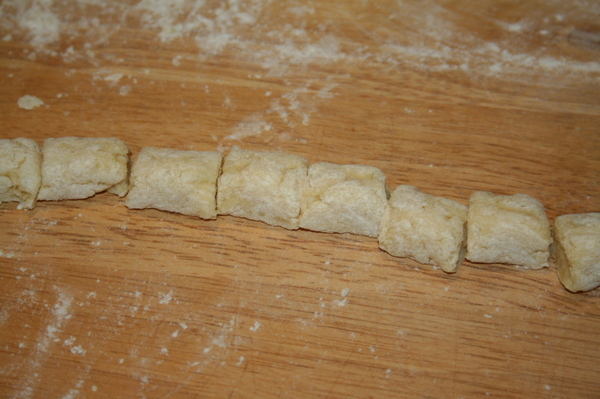 Cut the potatoes in half, lengthwise. 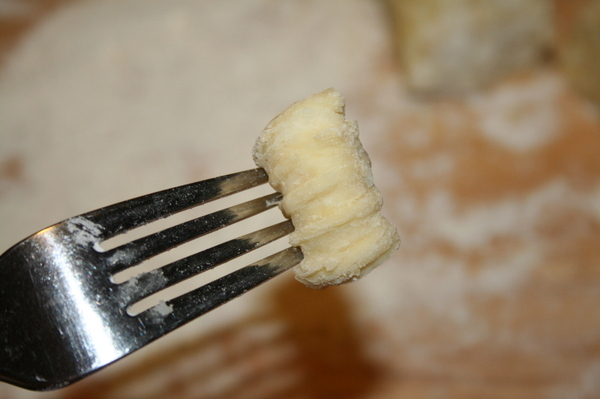 Hold one half potato in your palm and, with a fork, scrape the flesh out into the bowl. You can also peel the potatoes and put the flesh through a ricer. 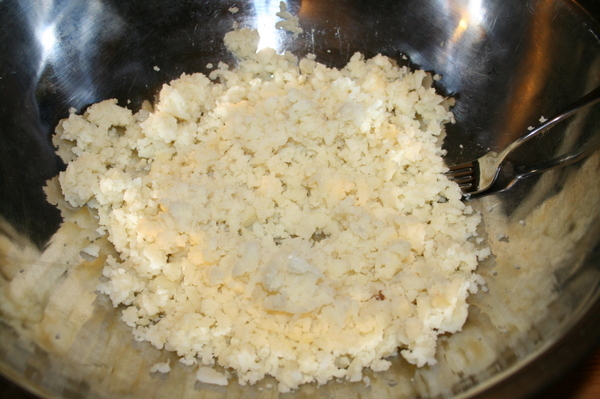 My ricer is small and it would have taken more time just to peel and cut them down to a workable size than it did just to scrape them out with the fork. And I have no idea what sort of odd pose this is with my hand. It's not a comfortable position to actually work with the potato. Also - if you are not fond of holding a scalding hot potato against your bare flesh, you can use a dish towel or pot holder to save your skin. 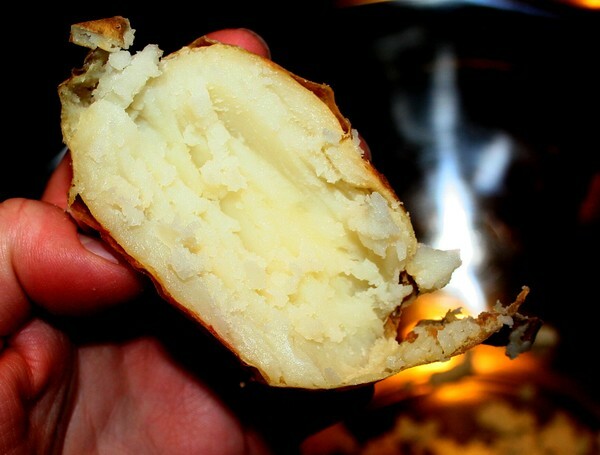 But try to do the scraping while the potato is still hot. It works better. You want to have about 4 cups of potato. You might have some little lumps, but just smash them against the bowl and you should be fine. 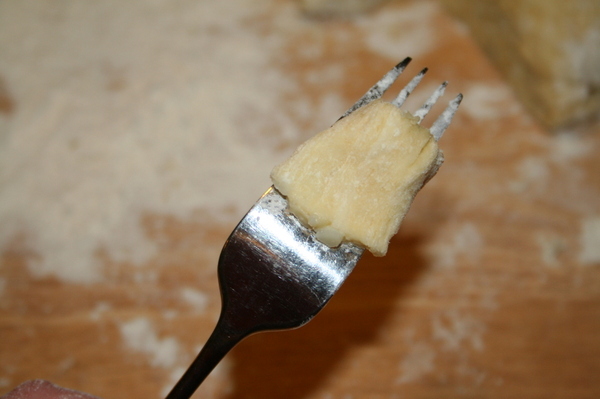 Next, add the flour/salt mixture to the potatoes and mix it together gently with the fork. The dough will be very sticky. 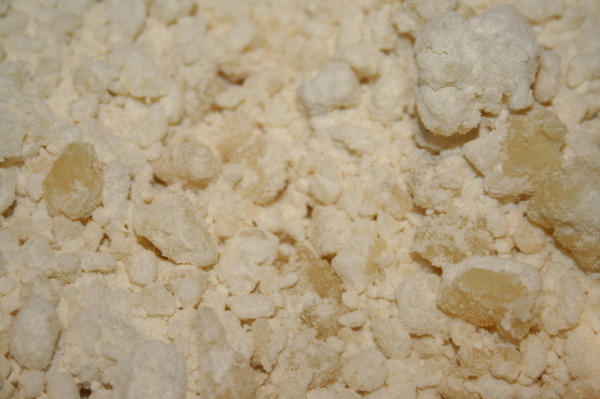 You'll need plenty of extra flour to keep the dough from sticking to your hands and your work surface. 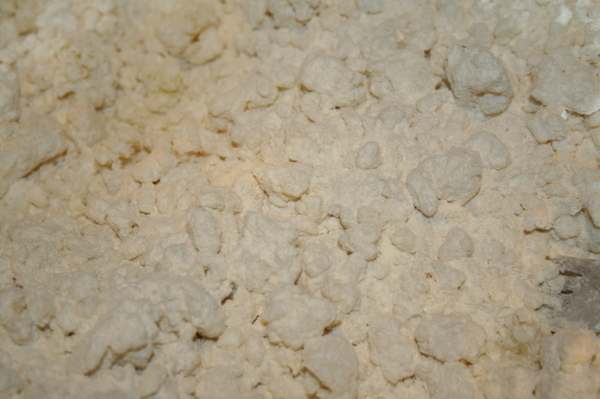 Dust the work surface with some flour and scoop a baseball-sized amount of the dough out onto the flour. 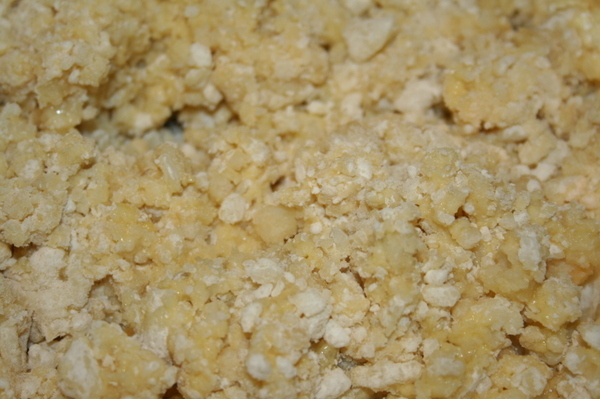 Sprinkle a little flour on top of the dough and dust your hands with it as well. 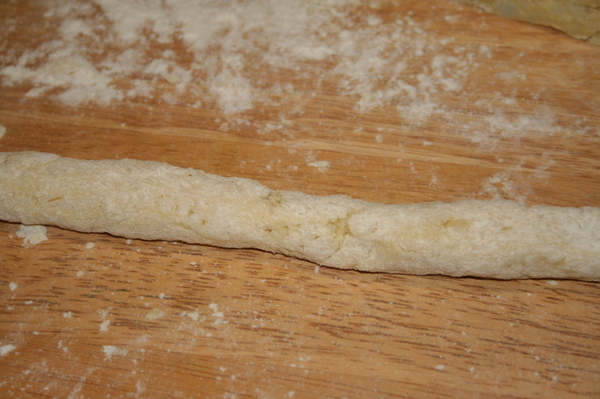 Now, with gentle pressure, roll the dough into a rope about half an inch in diameter. Now, if you want, you can stop here and either freeze them or boil them. They taste perfectly yummy regardless. You might want to use a little more flour than I did in the picture above - the dough is still pretty sticky and will adhere to the parchment paper after a while...scraping blobs of dough off the parchment kind of spoils the pretty stripes you worked so hard to create. Just a little tip for you. 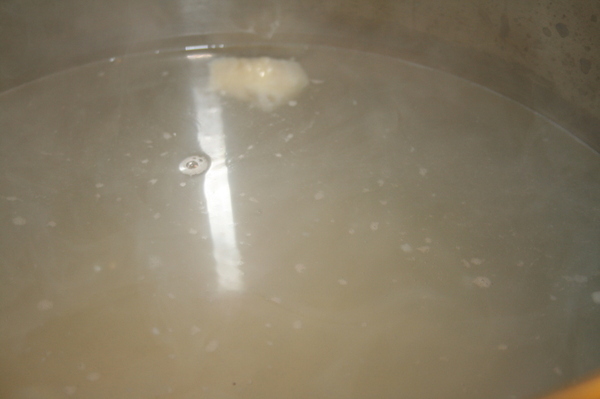 When they float to the top, the gnocchi are done. Scoop them out and put them into a bowl until you're finished cooking the whole batch. And now? 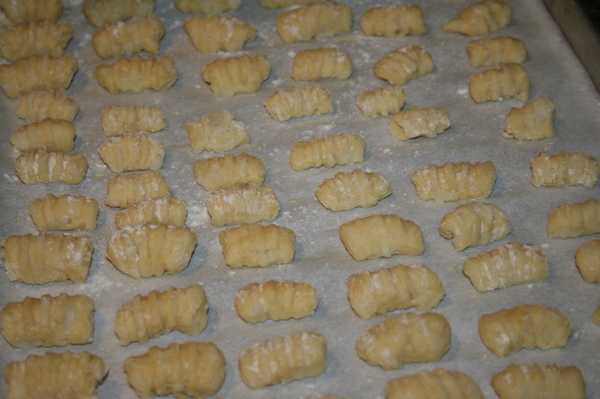 Well, you can toss them with a tomato sauce, or pesto, or butter and salt and pepper and grated parmesan. Whatever sounds good to you. The other night we served them along with coq au vin and some roasted root vegetables. Very satisfying on a cold winter night. Or even a not-so-cold winter night.